You should tuck them inside your Tri wetsuit, it's stops drag and stops them filling up with water!! The small won't fit you - I am a size 8.5 and I wear large, very comfortable. 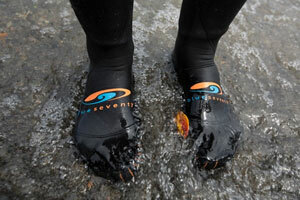 They are a snug fit and whilst they do collect water, the amount is so small it won't affect your swim. When I take mine off, they are just wet through, not ballooning with excess water.